Moor in Monaco during the most eagerly anticipated date of the Formula 1 calendar, the Monaco Grand Prix, and enjoy visits to the stunning islands of Corsica and Sardinia on this unique holiday. After a full day in Monaco soaking up the atmosphere of the Grand Prix Final, Royal Clipper cruises to the beautiful town of Lerici, gateway to the colourful fishing villages of Cinque Terre. Elba is known as the Pearl of the Mediterranean and a delight to explore, while Palombaggia is arguably the most famous beach in Corsica and the perfect place to relax. Stroll along the labyrinth of winding streets in historic Bonifacio, home to a magnificent 9th-century citadel, explore the medieval city of Alghero, and unwind on picturesque Porticcio Beach, before cruising to Ajaccio, the birthplace of Napoleon Bonaparte. The ancient principality of Monaco is famous for its Grand Casino and Grand Prix Circuit. Spend the day in Monaco during one of the biggest races in the Formula 1 calendar - the Monaco Grand Prix. 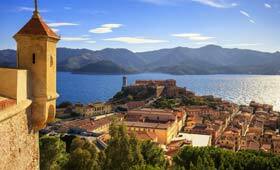 The lovely old town of Lerici is home to a magnificent castle, stately villas, enchanting gardens and beautiful beaches. Colourful Cinque Terre is easily accessed by ferry. Known as the Pearl of the Mediterranean, Elba is a glorious paradise of azure waters, hidden coves, tranquil beaches and stunning views. Elba's restaurants serve excellent seafood, and small private vineyards produce local Moscato and Aleatico wines. Relax on Palombaggia, arguably the most famous beach in Corsica. Later, Royal Clipper cruises to Bonifacio, where medieval houses cling on to soaring limestone cliffs. Perhaps explore the labyrinth of charming streets and traditional cafes in the beautiful Old Town, admire the impressive 9th-century citadel or wander around the marina, full of luxury yachts. The famous seaside resort of Porticcio has fine sandy beaches and warm turquoise waters – ideal for swimming or snorkelling. Ajaccio is set on a lovely sweeping bay and is dotted with fascinating sites relating to Napoleon Bonaparte, who was born here in 1769.